When you navigate a browser to a folder that contains one of the defined default documents, the default document will automatically load. However, how can you run HTML documents through the file server? Here are the steps to run your HTML documents through the file server on your computer. When a web page is run through the file server, file:// can be seen in a navigation bar (if visible). Files that are run through the file server, might be located anywhere on the drive. For your information, web files that contain a middleware language, such as PHP, ASP, JSP, etc. will not run correctly through the File Server and they must be run through the Web Server. 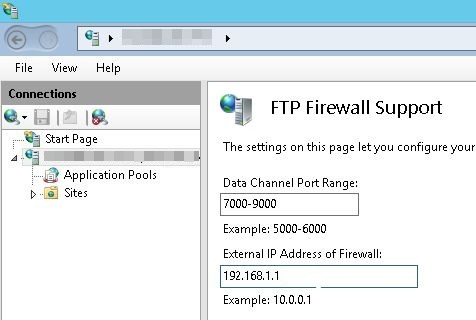 In this article you'll find out how to assemble a Firewall to support a FTP website in IIS. 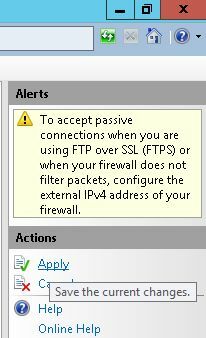 Through this text we are going to assemble the Firewall so the FTP Server may be enabled to receive a Passive knowledge association type the Firewall. First of all open your administrative Tools from the start Menu. 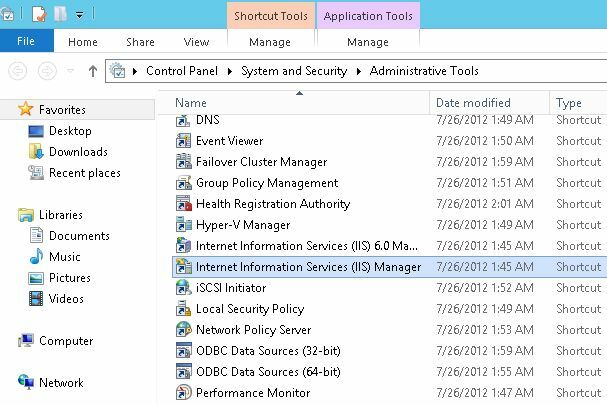 Now your Administrator Tools are going to be opened, among these tools you'll find an option named "IIS Manager", double click on this feature to open it. 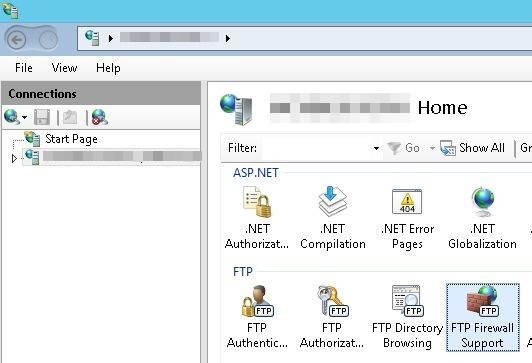 On the left hand side you'll see that a pane is provided named "Connection pane", during this connection pane your server name are going to be provided. And now click on this Server Name to open it. 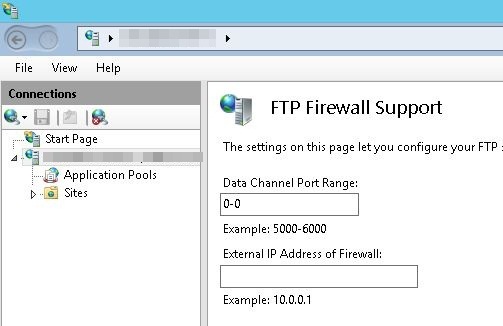 Now within the FTP features view an option will be accessible named "FTP Firewall Support", double-click on this feature to open it. Now the Firewall Support Page is going to be opened, here you'll see that 2 Text Boxes are provided, one for the port and another for the IP Address. Now offer the range of Ports for the data Channel Port range, however keep in mind that you just cannot offer the range between 0 and 1024 since these ports are reserved ports. 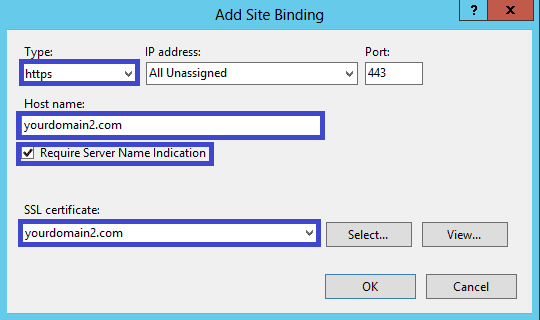 After providing the Port range and IP Address, click on the "Apply" button provided within the connection Pane. This article shows you how to install multiple SSL certificates for Server Name Indication using the Management Console on Windows 2012 Server. 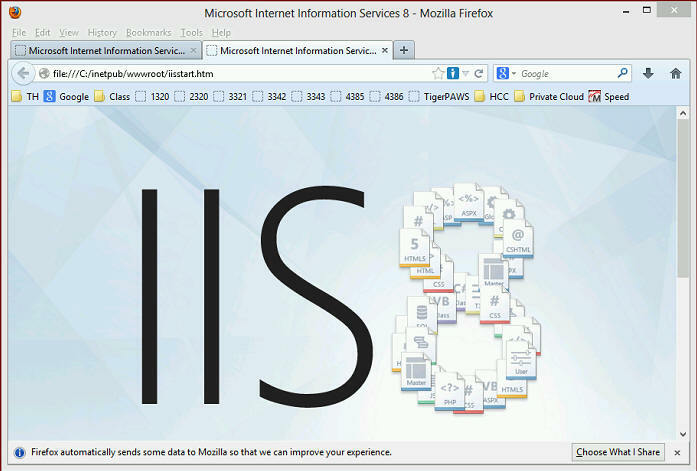 If you wish to install a single certificate on IIS 8, please refer to the IIS 8 SSL Installation Instructions. Or if you didn't generate a certificate request (CSR) yet, and didn't order a certificate, please see IIS 8 SSL Certificate Request Instructions. Save the certificate you received to the desktop of your Windows 2012 Server. 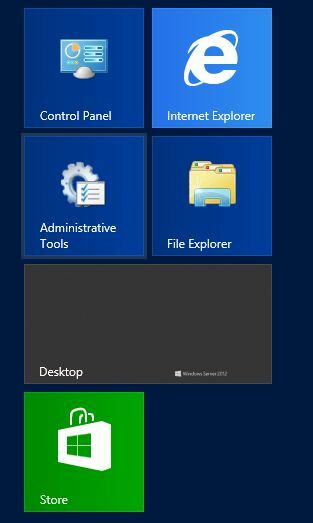 Open the IIS console by clicking Start, then opening Administrative Tools, then Internet Information Services (IIS) Manager. Click on your server's name in the left pane. 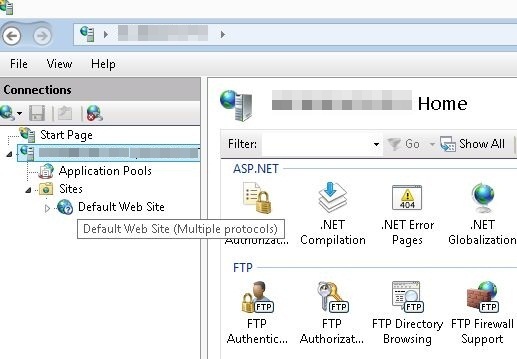 In the center pane, double-click Server Certificates in the IIS section. In the Actions menu in the right pane, click on "Complete Certificate Request" to open the Complete Certificate Request Wizard. Browse for the certificate file you just saved to your desktop. Enter a friendly name to identify the certificate with. This name will not be part of the certificate, but serves to identify the certificate for the server administrator. Use the same domain name you used when requesting your certificate. Select the Web Hosting certificate store. Click OK to store the certificate on the server. You may encounter a known issue on IIS 8 if you receive the message "Failed to remove the certificate". In that case, click Cancel to exit the dialog, and refresh the server certificates list by pressing F5. If your certificate appears in the list, it installed correctly. However, you may want to check that it was saved to the correct Web Hosting store. If your certificate doesn't appear, you will need to re-issue your certificate with a new CSR. 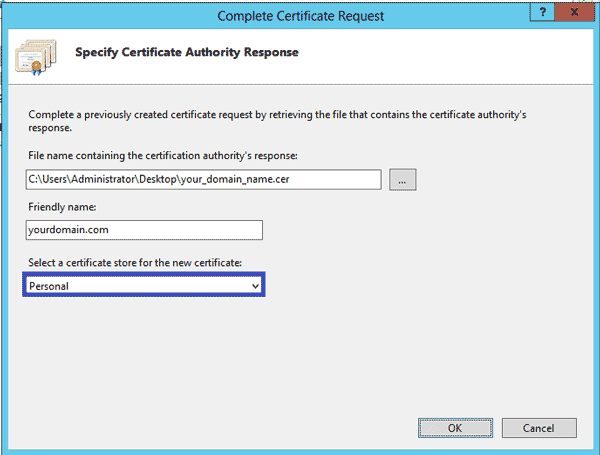 The certificate is now installed on the server, but must be assigned to a web site in IIS. Click on your server name in the left pane to browse the sites, and select the site you wish to assign the certificate to. 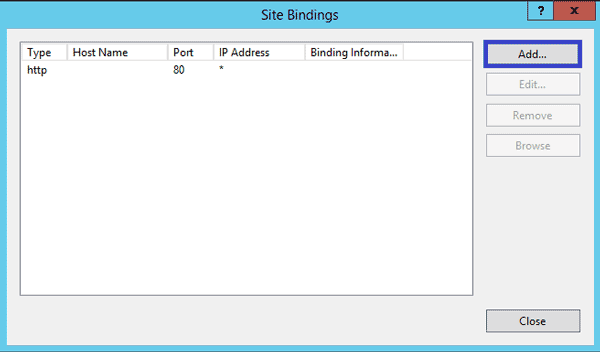 In the Actions menu in the right pane, click "Bindings" to add a binding. In the Site Bindings window, click "Add" to open the Add Site Binding window. Select https as type. The IP address should be the one your website is listening on. Alternatively, you can leave the dropdown to All Unassigned. Leave the TCP port to 443, and select the correct certificate from the dropdown. Your first SSL certificate is now installed, and the main website is ready to accept SSL connections. Repeat all previous steps for installing your second certificate, up to step 9. 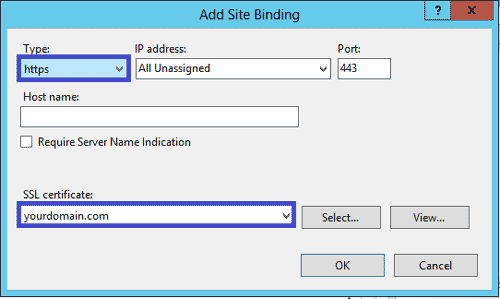 In the Add Site Binding window, you should now check the box Require Server Name Indication. This is not required for the first certificate, which is the server's main certificate, but it is for the second and any additional certificates installed. Repeat the steps above for your third and any additional certificates you wish to install. 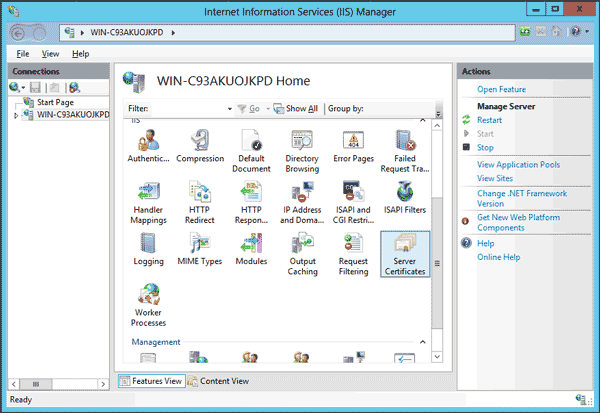 The IIS Manager Wizard will open. On the left hand side will be the Connections Pane. Next step, expand the Server Name available under the Connection Pane, on expanding an option will appear named "Sites", again expand this option. This will bring the default Website under the IIS. Click on this default Website, on clicking an option will come in the center Pane named SSL Settings, double-click on it to open it. Now, check the "Require SSL" and then select on the "Accept Client Certificate". Go to the Actions Pane and then select on the "Apply" button to apply the changes made. Try our IIS 8.0 Hosting with Free ASP.NET Hosting today and your account will be setup soon! You can also take advantage of our Windows & ASP.NET Hosting support with Unlimited Domain, Unlimited Bandwidth, Unlimited Disk Space, etc. You will not be charged a cent for trying our service for the next 3 days. Once your trial period is complete, you decide whether you'd like to continue. 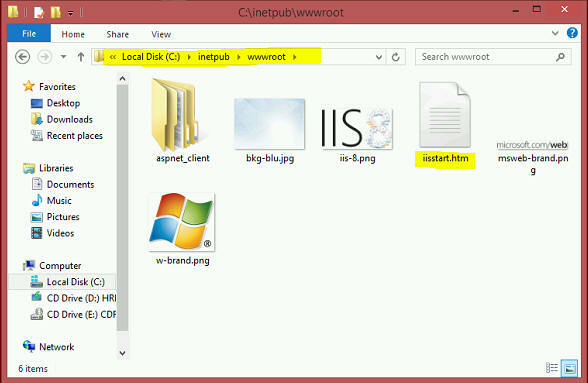 In this tutorial, I’ll explain how to install WCF in IIS 8.0. So in order to host our WCF Service in IIS, use the following simple step-by-step approach. First, Add a website to our solution. 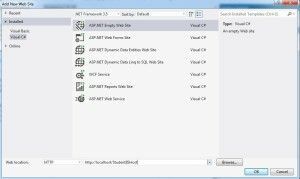 select the “ASP.NET Empty web Site” example. For web location, select “HTTP” rather than “File System” and provide the path and press the “OK” button. Next step, add the Reference of the StudentService project to our web site, in other words StudentIISHost. Next, Add a reference of System.ServiceModel to the web site. And then, Add a new .svc file to our web site project as. Finally, Access the hosted WCF Service, in other words StudentService using the following path. 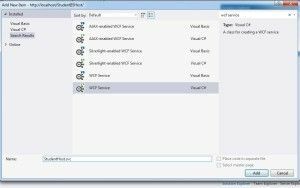 I hope this WCF Tutorial will help you to understand the implementation for hosting a WCF Service in Internet Information Services (IIS). This article shows you how to install an SSL certificate, using the Management Console on Windows 2012 Server. 1. Save the certificate you received to the desktop of your Windows 2012 Server. 2. 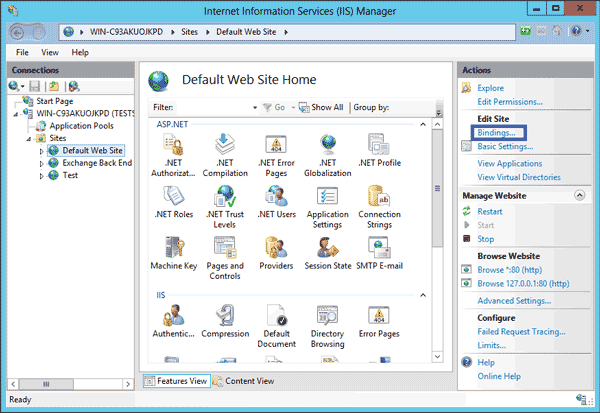 Open the IIS console by clicking Start, then opening Administrative Tools, then Internet Information Services (IIS) Manager. 3. Click on your server's name in the left pane. 4. 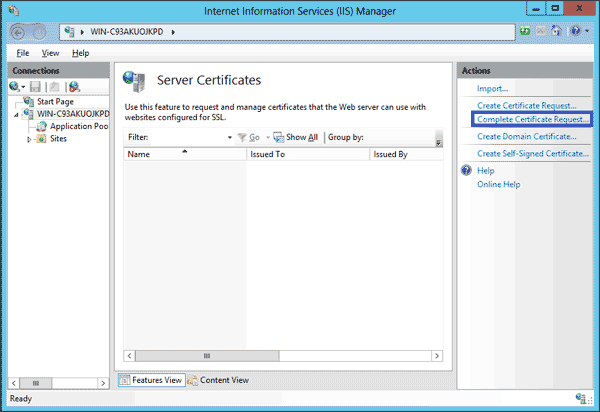 In the center pane, double-click Server Certificates in the IIS section. 5. 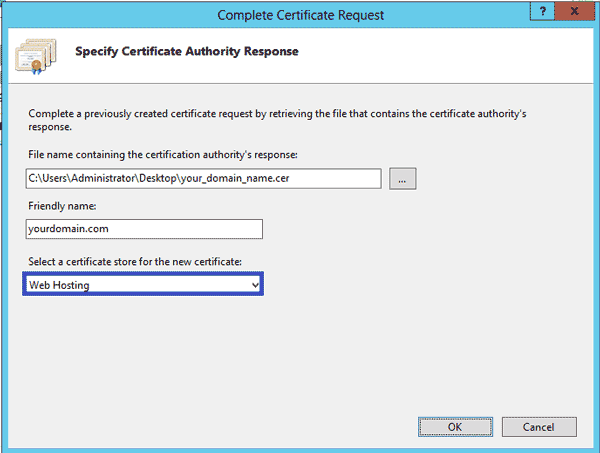 In the Actions menu in the right pane, click on Complete Certificate Request... to open the Complete Certificate Request Wizard. 6. Browse for the certificate file you just saved to your desktop. Enter a friendly name to identify the certificate with. This name will not be part of the certificate, but serves to identify the certificate for the server administrator. Use the same domain name you used when requesting your certificate. Select the Personal certificate store. Click OK to store the certificate on the server. 7. The certificate is now installed on the server, but must be assigned to a web site in IIS. Click on your server name in the left pane to browse the sites, and select the site you wish to assign the certificate to. In the Actions menu in the right pane, click Bindings to add a binding. 8. In the Site Bindings window, click Add to open the Add Site Binding window. 9. Select https as type. The IP address should be the one your website is listening on. Alternatively, you can leave the dropdown to All Unassigned. Leave the TCP port to 443, and select the correct certificate from the dropdown. 10. The Site Bindings window should now correctly reflect the addition of the certificate, which is now ready to be used by your website. Congratulations! 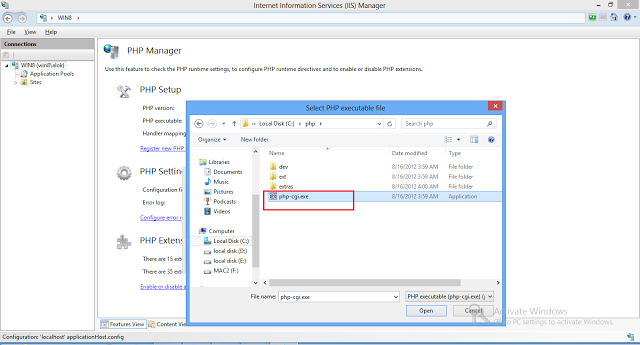 In this tutorial, I will show you how to install PHP and configure IIS to PHP Webpages Server. PHP is a widely used general-purpose scripting language that is especially suited for Web development and can be embedded into HTML. This guide is recommended for IIS 8.0. Easily install, configure, and manage troubleshoot in one or many PHP versions on the same IIS server. 4. 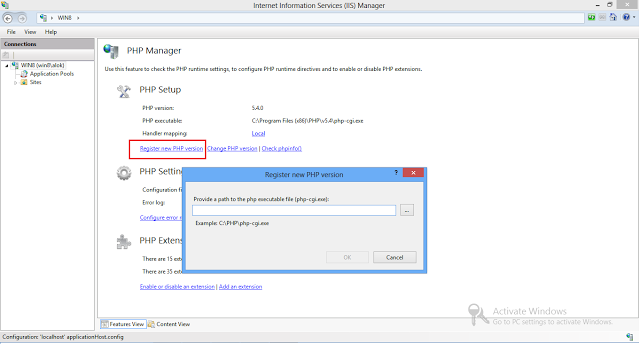 Open PHP manager and click on "register new php installation"
6. 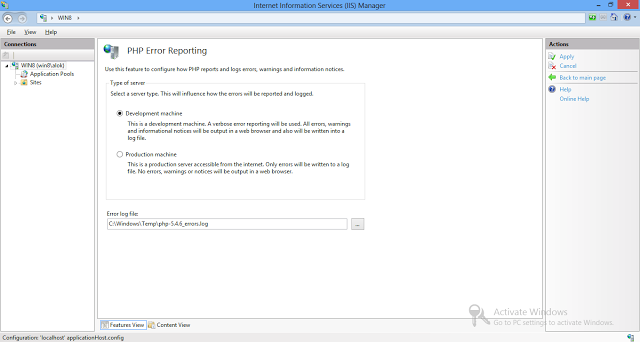 Now, check phpinfo and choose "error reporting"